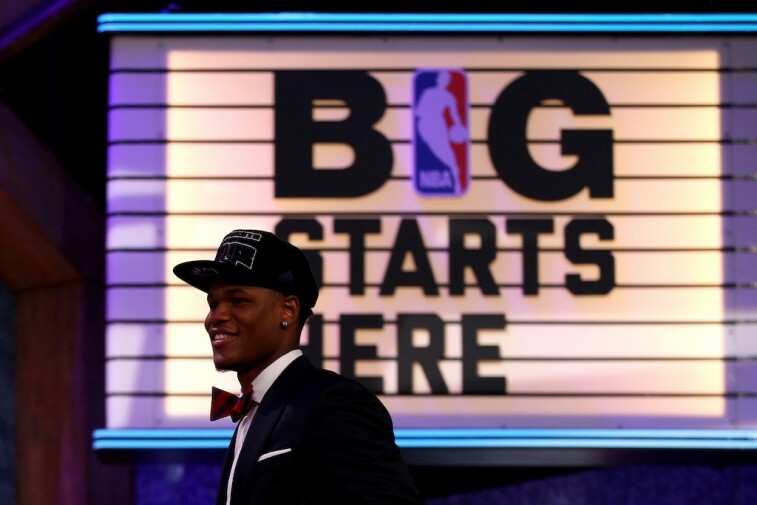 On Tuesday night, the NBA Draft Lottery unfolded, and 14 franchises found themselves at the mercy of a bunch of unpredictable ping pong balls. 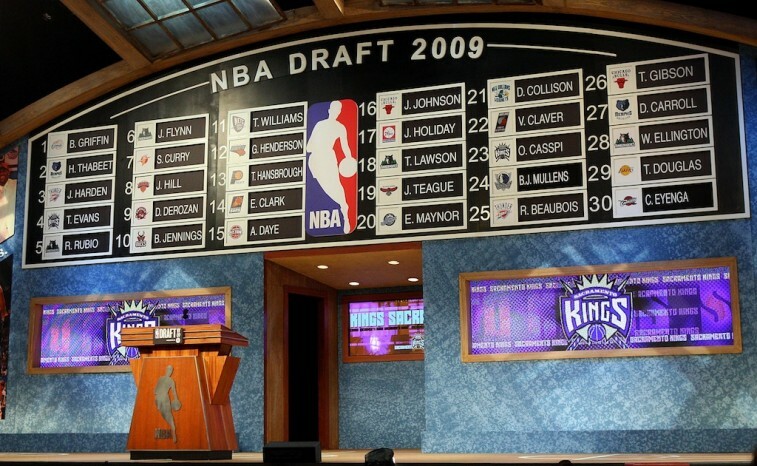 But when the dust settled and the cards were read, we finally learned where each of these lowly teams would be picking in the upcoming 2015 NBA Draft. And now things really start to get interesting. If we had to pick a winner on the night, we’d have to go with the Los Angeles Lakers. Heading into the lottery, the purple and gold were projected to end up with the fourth overall selection. Instead, fate had other plans for this storied franchise, and Los Angeles found itself in the second spot. Of course, if this team won the evening — aside from the Minnesota Timberwolves who will be selecting No. 1 — then the loser turned out to be the New York Knicks. This organization is in desperate need of a foundational big man. However, by falling to the fourth pick (after being projected at No. 2), the Knicks now found themselves on the outside looking in. Unfortunately, when things are left up to chance — and ping pong balls — there’s always the possibility of disappointment. Still, that doesn’t stop us from loving this game. With the draft order now set, let the debate begin. 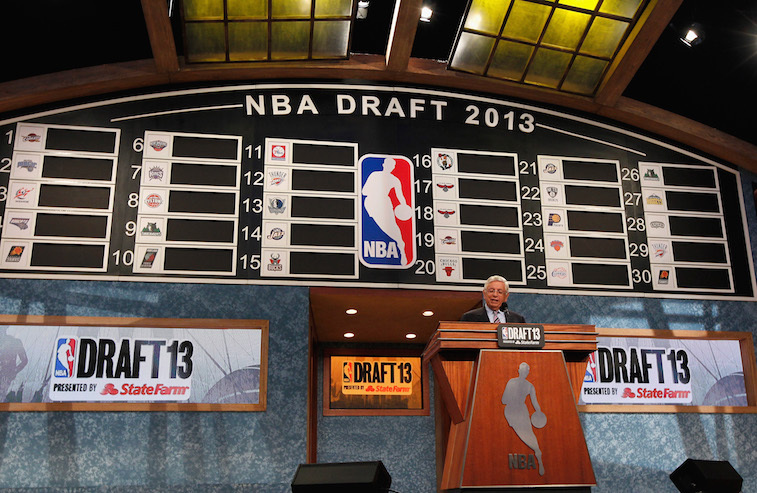 After more workouts and team meetings, we’re positive that most draft boards will begin to shift. 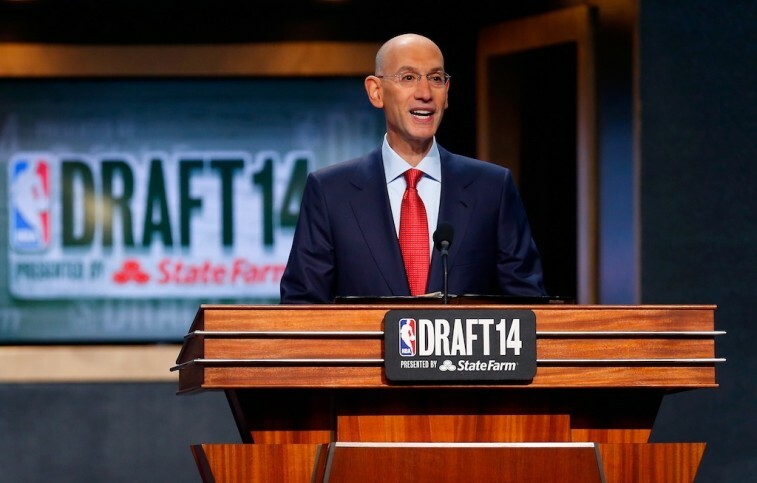 However, until that time comes, here’s a look at our 2015 NBA Mock Draft: Post-Lottery Edition. Karl-Anthony Towns has to be the pick here. He may not be a finished product on the offensive end of the floor, but the Kentucky freshman can knock down his free throws (81.3% on the year) and is total game-changer defensively. After showing flashes of brilliance in the NCAA tournament, it’s clear that Towns is a special player. If the Timberwolves were to pair him with budding star Andrew Wiggins, then this team should be out of the NBA cellar in no time. With the ping pong ball bouncing their way, the Los Angeles Lakers are now in a position to draft Duke freshman Jahlil Okafor. The 6-foot-11 center has soft hands, impeccable footwork, and is arguably the most polished offensive big man to enter the draft in years. He and Julius Randle could do great things in Tinseltown for years to come. D’Angelo Russell has excellent court vision, a sweet handle, and can shoot the rock (he’s been likened to Houston’s James Harden). In his lone year at Ohio State, Russell put up 19.3 points, 5.7 rebounds, and 5.0 assists per game, and showed fantastic composure on the floor. The 76ers are good in the front court — with Nerlens Noel and Joel Embiid — but they need a floor general with the ability to score. Russell is their guy. No luck for the Knicks. They wind up with the fourth pick and lose out on getting one of the prized big men. Still, a team could do worse than Emmanuel Mudiay. His outside shot needs work, but the 6-foot-5 guard showed he could handle pro ball, by impressing in China. He’s strong, athletic, and can attack the bucket. Plus, the 19-year-old feels it would be a “blessing” to play for the Knicks. That kind of enthusiasm may persuade this team to reconsider trading this pick. Justice Winslow was a standout during this year’s Big Dance, and his stock’s been rising ever since. He already has the NBA-body, his energy is contagious, and he’s crazy athletic. Winslow may struggle with his mid-range game and his measurables aren’t ideal, but he can hit the three and is explosive on both ends of the floor. This guy would be a quality wing for the Orlando Magic. The Sacramento Kings would love to find another big man to complement DeMarcus Cousins. If Willie Cauley-Stein is still on the board, then he would be a perfect fit. Cauley-Stein is a defensive monster with excellent rim protecting ability. He’s definitely an interesting personality, but at least he isn’t lacking in confidence — thanks, Larry Bird. There is a good chance that Kristaps Porzingis may rise up draft boards after team workouts, but we like him here at this point. The Latvian power forward is still a bit raw but scouts have been raving about him. At 6-foot-11, Porzingis is freakishly athletic, can stretch the floor, and protect the rim. Teams will certainly be intrigued by his potential. We think he’d be a great fit in Denver. Mario Hezonja is another international talent that most folks don’t know about. However, he’s extremely athletic and a skilled shooter. If he gets hot from the outside, you can forget about it. The Pistons are in dire need of shooters, and Hezonja is one of the best in the draft. Stanley Johnson is already NBA-ready. He averaged 13.8 points and 6.5 rebounds in his lone season at Arizona, and showed he was capable of playing multiple positions. The Charlotte Hornets could utilize his athletic ability and talent right away. Considering Johnson still has a ton of upside, this would be a smart pick for the Hornets. Kelly Oubre only shot 35.8% from three during his freshman season at Kansas, but we expect that to change. He needs some time to develop, but his athleticism and insane 7-foot-2 wingspan make him someone worth taking a chance on. Myles Turner is a big with great hands, who can also face up and hit the jumper. He averaged 10.1 points and 6.5 boards in his one season at Texas, and there is a lot to like about the 6-foot-11, 240-pound center power forward. In this day and age, his ability to pick and pop is very valuable, and teams need that. Bird may love Cauley-Stein, but we think he’d have no qualms with taking Turner. Frank Kaminsky has proven time and again that he has a winning mentality. He’s mature, versatile, and can knock down the three (he shot 41.6% this past year). As a seven-footer, who can extend the floor, he would add an extra dimension to the Utah Jazz offense. Devin Booker is a 6-foot-6 guard with an impressive basketball IQ. But what makes him truly stand out, is his shooting touch. During his lone year at Kentucky, Booker shot 41.1% from three and had an overall field goal percentage of 47%. In the NBA, you need shooters. Booker may very well be the best one in the draft. The Oklahoma City Thunder need someone with the ability to backup Russell Westbrook at point guard. Murray State’s Cameron Payne has the chops to fill that role. He notched 20.2 points and 6 assists per game this past season, and is an intelligent player. Payne would be a nice replacement for Reggie Jackson. Sam Dekker proved his worth in the NCAA tournament, helping lead the Wisconsin Badgers to the national championship game. He’s tough, athletic, and knows how to get to the rim. He would be an excellent fit with the team-oriented Atlanta Hawks. Arkansas power forward Bobby Portis was a Second-Team All-American in 2015, averaging 17.5 points, 8.9 rebounds, and 1.4 blocks per game. He’s an explosive player with an impressive motor. Brad Stevens would absolutely love this kid’s energy. Kevon Looney only played one season for the UCLA Bruins — averaging 11.6 points and 9.2 rebounds — but he showed enough upside that teams may take a gamble on him. He is still unpolished, but his length and versatility would work well for Jason Kidd’s Milwaukee Bucks. The Houston Rockets are in desperate need of a point guard, and Jerian Grant makes sense here. He’s experienced, smart, a leader, and reliable. Grant is a gritty player, who we believe could provide some stability in the Rockets backcourt. Trey Lyles could very well go higher in this draft. At Kentucky, the 6-foot-10 freshman was extremely versatile, provided John Calipari with another solid scoring option. If he were to fall into the Wizards’ lap, they’d be hard-pressed to pass him up. Lyles has a high basketball IQ, a 7-foot-4 wingspan, and enough strength to be effective at the next level. Rondae Hollis-Jefferson is a small forward with an NBA-ready body, and the ability to help out on the defensive end right away. During his sophomore year at Arizona, Hollis-Jefferson put up 11.2 points and 6.8 rebounds and provided a high motor. The Raptors could certainly use his energy. Everyone is well aware that the Rajon Rondo experiment in Dallas was an utter failure. As a result, the Mavs still need a point guard. Getting Duke freshman Tyus Jones at No. 21 would fill that hole. He is smart, composed, and owns the big stage. He may not have the ideal size, but his intangibles are off the charts. It’s never a bad thing for the Chicago Bulls to have quality players at the guard position. You never know when someone will go down with an unexpected injury. At 6-foot-five, Utah’s Delon Wright is a reliable floor general who doesn’t make too many mistakes. He would be a nice get for the Bulls. The Portland Trail Blazers don’t know what’s going to happen with LaMarcus Aldridge, so getting deeper at the four-spot is not a bad idea. Louisville’s Montrezl Harrell is strong, ferocious, and plays extremely hard. He may be a bit undersized (6-foot-8) for the position, but his motor should more than make up for that. Georgia State’s R.J. Hunter is a lights-out shooter, who is much better than his 30.5% from three-point range (during his senior year) would suggest. He had one of the most incredible moments of this year’s NCAA tournament, and we expect he could be a lethal addition to Cleveland’s offense. Virginia’s Justin Anderson could be a steal at this point in the draft. This past season, the 6-foot-6 small forward averaged 12.2 points per game and shot 45.2% from three. He is smart, explosive, and could play multiple positions in the NBA. Anderson could prove to be a great floor spacer for the Memphis Grizzlies. UNLV’s Christian Wood is an athletic power forward with defensive instincts and an affinity for rebounding. He is still a bit raw and could stand to gain some weight, but San Antonio would be a great place for him to develop — Gregg Popovich sure knows how to get the best out of his players. Jarell Martin is a 6-foot-10 forward, who only played two seasons for the LSU Tigers. However, in that time, he had improvements in his scoring, rebounding, assists, steals, and free throw percentage. At pick No. 27, Martin would be a solid addition to the Lakers’ front court. Syracuse’s Chris McCullogh only drops this far because he tore his ACL back in January. However, if Boston is willing to be patient with his recovery, then they could end up with a great defender, who has solid length and the ability to be effective in transition. In his lone season at UNLV, Rashad Vaughn averaged 17.8 points per game and shot 38.3% from three-point range. He’s a skilled player, but is also fairly young. Taking him may prove to be a risk — but it could very well work out for that team in the end. Terry Rozier is a clever point guard that, at times, played huge for the Louisville Cardinals. He’s explosive, quick, and can score off the dribble. He would make a nice backup for Stephen Curry, and we could see the folks in Golden State falling hard for this kid. 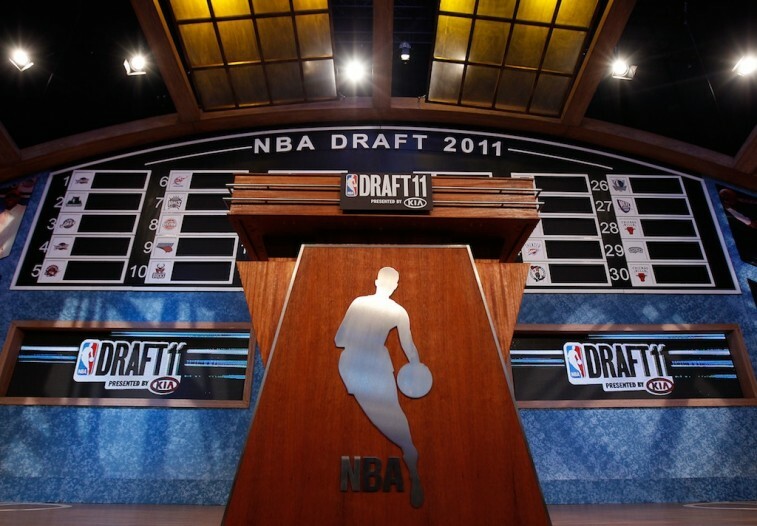 All statistics are courtesy of SR/College Basketball and NBADraft.net.